Summer may be over, but it doesn’t mean that we’re done with the mindless blockbusters just yet. 'Real Steel' is a film about robots and boxing - a quick search on IMDb will turn up comparisons to 'Rocky' and 'Robot Wars'. I think it looks like a film version of the Rock ‘Em Sock ‘Em. The film is based on 'Steel', a short story by Richard Matheson. It has already been adapted once as an episode of 'The Twilight Zone', but this looks like it will be a very loose adaptation. 'Steel' had a dystopian setting, and was a subtle contemplation of man’s replacement by machines. 'Real Steel', on the other hand, seems to go for a vanilla-flavoured ‘man vs. insurmountable odds’ approach. There is also (yet) another father-son relationship story, which promises to drag, but hopefully this will be outweighed by everything else. Technically, 'Real Steel' looks great. The designs of the robots look imaginative and detailed. From the look of clips and trailers, there will be some decent action choreography. Non-human violence doesn’t tend to incur the wrath of the censors, so in theory the fights can be as nasty as the filmmakers want them to be. The editing looks fairly non-invasive, so maybe we will be able to see the action for a change. Then again, 'Transformers' looked great but it took three outings to get the action right. When I think of 'Real Steel', I am reminded of 'I Am Legend' and Isaac Asimov’s 'I, Robot'. Both of them were works of intelligent and subtle science fiction, lobotomised in the transition between page and screen. I have a feeling that this story will be treated in a similar manner, utterly devoid of Richard Matheson’s deeper, thought-provoking ideas. It’s not necessarily a bad thing. I actually enjoyed watching both of the Will Smith vehicles. Being different from source material doesn’t mean that a film can’t be fun. This release looks like it will be worth checking out, albeit with a considerable amount of popcorn. 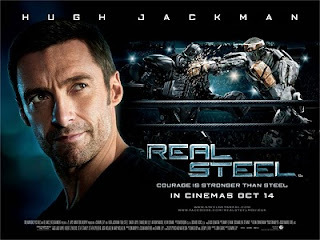 'Real Steel' is scheduled for wide release across UK cinemas on 14th October '11.